Born in Ohio to Russian immigrants, Wexner started The Limited in 1963 with a $5,000 loan from his aunt. He nurtured that investment into a $10 billion company whose brands include Victoria’s Secret, Bath & Body Works and Henri Bendel, among others. Through the years, he has grown and spun off top retail brands such as Lane Bryant, Abercrombie & Fitch, Lerner New York, Express and his flagship property, The Limited, as the retail environment has evolved. In addition to his business pursuits, Mr. Wexner is committed to giving back and making a difference. In 2012, Ohio State University renamed its Medical Center the Wexner Medical Center in honor of his generous support. And L Brands employees and Victoria Secret supermodels regularly participate in volunteering events. For example, for this year’s 22nd Komen Race for the Cure celebration in Columbus, Ohio, L Brands brought in nearly 10,000 participants and guests. 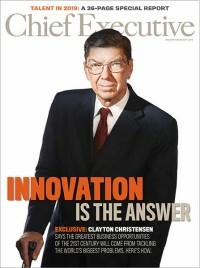 “Les has the complementary skills of being an extraordinary visionary and entrepreneur, while at the same time having the leadership prowess to scale that business into a giant and consistently maintain it over the long-term,” said J.P. Donlon, editor in chief of Chief Executive magazine. Wexner was presented with a Lifetime Achievement Award from Chief Executive magazine at the CEO2CEO Summit, held Thursday, Dec. 4 at the New York Stock Exchange, after which he spoke to the audience about his experiences starting and building a retail business. Roughly 100 mid-market CEOs were in attendance, as well as key speakers including Andrew Liveris, CEO of Dow Chemical. “If I had to make one suggestion it would be, instead of a lifetime achievement award which sounds terminal, how about the so-far achievement award?” Wexner joked. Clearly, Wexner has redefined the lingerie category.